Having the potential of facing student loan repayments of over $100,000 should make anyone pause. Questions run through your head, usually more defensive in nature. “Can I really do this?” “Should I do this?” “How can I pay for this?” As is often the case, those of us currently in or seeking entry into the health professions, the sticker shock goes away. It is quietly locked away to be dealt with at a future time. We forge ahead telling ourselves, “Everyone else is doing it.” In fact, we know more than one friend or acquaintance making it work in a doctor of physical therapy (DPT) program or at another expensive allied health program such as pharmacy. We tell ourselves, “I can find a way, too! I will just bite the bullet now and pay later.” Knowing that professional school is expensive for everyone, many of us just accept that fact, and do not investigate the wide differences in cost between the 225 DPT programs. That is where many student searches go WRONG! Although, it is essential that students pick a DPT program using other valid factors such as GPA and GRE, cost should NEVER be avoided. Unless you have a free ride or you are just loaded with cash, it is the elephant in the room before graduation that becomes a whale of debt once you start practicing. Having a huge student loan repayment is a large factor at delaying big ticket items like getting married or try buying a house. In the article, I will outline five easy steps to compare physical therapy school costs for both in-state and out-of-state programs. Like making any other difficult decision, it helps when a person breaks down the deciding process into clear manageable factors. For a more simplified search, I will use my home state of Arizona, but the steps work on a multi-state search as well. Step 1. Can I Move or Commute? It is essential to be aware of the location of the doctor of physical program to know if it is even in the running to spend time investigating the full cost. Frankly, can you pick up and to move to the location or can you spend the time and money in transportation. If you are a student with a family or a spouse who works, you may not be able to live or commute 2 hours across town for the length of the three year program. However, if you are free to move, you are automatically provided with distinct advantages in program choice. In our test case, the state of Arizona is ideally set up for those being able to move to flagstaff for the in-state tuition advantages. There are five Doctor of Physical Therapy programs, four of which are located in the Greater Phoenix Area. The fifth school is located in Flagstaff approximately 2 to 3 hours away from the other schools adjacent to the San Francisco Peaks, the highest mountain range in Arizona. Even if you are located in Phoenix, Northern Arizona University has an extension program located centrally for an easier commute. If you are sure that you cannot move or commute to a certain DPT program, scratch them off your plan to apply list. Otherwise put them on your revisit list. If other factors make the school more attractive, you can consider relocating. Step 2. Compare The Biggest Factors, Price Included. It is very common to overlook the institution type before we try to jump ahead to delist a school or commit to apply to a specific institution. Just because you know of a specific school or someone who has attended there, do not automatically limit yourself to that program without researching your other options. Do you know its competition? What do the other schools offer to you that is the same or different? Be assured many of them will directly affect your checkbook and lifestyle. Private vs public, student population, scholarship opportunities, location, class size, etc. Emotions can take control of us. Desperation or lack of research is a common theme of pre-health students as they try to match themselves to a program. Do not let that be you! Set aside several months to research the process and take your time, this is a big investment. Spend time doing background research before spending $60,000-200,000. In order to understand more about each institutional factor, try using our “Perspective Exercise” Worksheet in the “PT Success” e-book. Below is a listing of the cost for each school in Arizona. This simple step of looking at price across the board can clarify things, especially in a larger state such as California with 16 programs or New York with 21. For many student with high GPA and GRE scores, price may be one of the main areas of concern when trying to decide on a school. While others with marginal scores, price will be lower on their radar. Price becomes just another factor in choosing between schools. What about you? Listing out the differences between GPA and GRE can be crucial in both state and multistate searches. In future articles, I will go over how GPA and GRE scores are integral in how your choose a DPT program. For a more complete explanation of GRE and GPA scores, see sections 1.2 for GPA and 1.3 in GRE in the “PT Success” e-book. 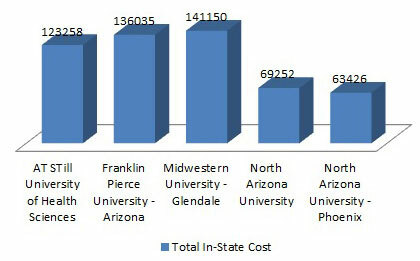 In this example, the cost of the five Arizona schools follows along the typical path of in-state and private institution price differences. In-state applicants have a distinct price drop, but out-of-state applicants are more comparable to the private institutions. 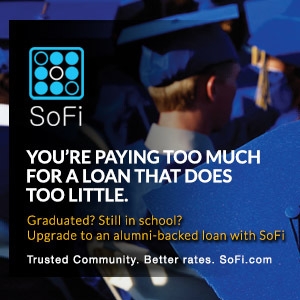 Even with out-of-state rates, the public universities still have the advantage of an almost $20,000-$40,000 in savings. It should be noted, however, that Arizona’s private institutions are very competitive in price structure when compared to other private programs across the nation. 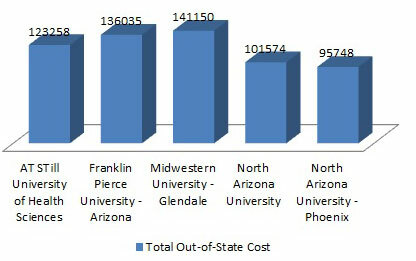 Below are the grossly estimated tuition figures for the five Arizona Doctor of Physical Therapy programs. * (for more specifics see the source links in the cost section of each school*). Compare Figure 1-1 with 1-2 and you will notice the drop of the in-state tuition prices at the state schools. If you are sure that you cannot afford a certain DPT program, scratch them off your plan to apply list. Otherwise put them on your revisit list. Maybe other factors make the school more attractive in the future. The average cost living cost can be grossly averaged for the four schools as they are located in the same location. 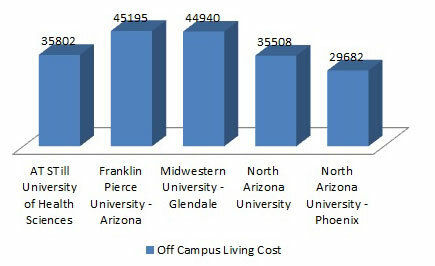 The living cost in Flagstaff can be expected to be slightly higher than central Phoenix, Arizona. A thrifty student can live under the expected off campus costs with additional roommates, cheaper food, and by limiting the higher priced rental options. Just remember that lifestyle spending is one of the aspects of spending you can control. If you are certain you cannot afford the rental/living expenses in the area around a specific DPT program, scratch them off your plan to apply list. Otherwise put them on your revisit list. Maybe other factors make the school more attractive in the future. With all this justifiable talk about including cost into your search for a matching DPT program, it is imperative you keep it in perspective. For most people, there are other admission factors that are crucial for picking the right school for you. You must keep in mind the factors in step one and two. In the state of Arizona – for example – location, class size, GRE and GPA scores all play a key role. Over 2.7 million Arizona residents live in the Greater Phoenix Area and many need or want to go to school locally. That eliminates Northern Arizona University in Flagstaff, one of the two public DPT programs from the mix. 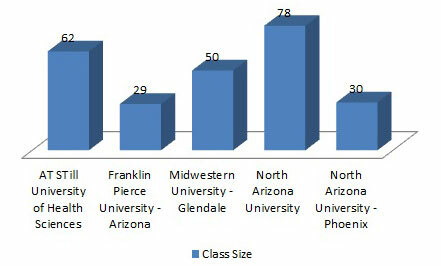 The limited class sizes are also integrally important in a state such as Arizona. For next year’s entering class there are only 249 slots in just five DPT programs in a state consisting of over 5.5 million people. Beside location and class size, other standout factors are GPA and GRE acceptance rates. As these are more complex in nature they need sufficient and separate treatment. I will address both of these in upcoming articles. As stated earlier, two sections on how to use both GPA and GRE are in the free downloadable PDF “PT Success” situated on the front of the site.